Red represents the pinnacle of Focusrite’s interface range. 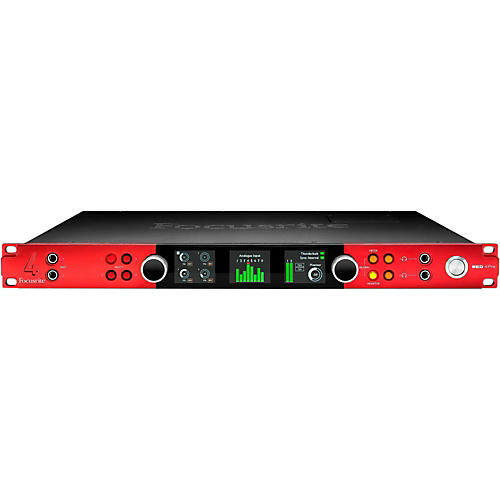 Red 4Pre combines four of Focusrite’s digitally-controlled, 'Air' enabled, Red Evolution mic preamps with dual Thunderbolt 2, Pro Tools | HD and Dante network audio connectivity. Featuring 'parallel path summing' conversion and beautiful yet robust design, the Red 4Pre interface is the perfect balance of form and function, delivering the sound quality and versatility engineers and producers expect from Focusrite. Focusrite's 58-in/64-out Red 4Pre includes Thunderbolt 2 connectivity for our lowest round-trip latency, in whatever DAW you use, enabling you to track and overdub with your preferred plug-ins and effects in real time, simplifying your workflow. Drop the Red 4Pre immediately, directly and seamlessly into any Pro Tools | HD system, or use it with existing Avid® interfaces, thanks to its twin DigiLink™ connectors. Dual Thunderbolt 2 ports allow daisy-chaining of additional components such as hard drives and displays. Plus the Red 4Pre is network audio enabled right out of the box, with dual Ethernet ports for Dante audio-over-IP networking, letting you expand your recording capability over Ethernet for up to 64 additional channels anywhere on your network, with low latency – and lower cost. Additional Red or other Dante-compatible components can be connected to the Ethernet ports of the Red 4Pre to provide additional channels irrespective of the interface used to drive the Red 4Pre. The Red Evolution mic pres in the Red 4Pre deliver a clear and honest audio performance with –129 dB EIN and 63dB of gain that allows plenty of room to bring your own sound to life with your choice of external processing. The mic pres can be controlled digitally, for adjusting/recalling settings and stereo linking via Focusrite Control software. They also include our unique ‘Air’ effect, recreating the sound of the transformer-based mic preamps in the ISA range. When ‘Air’ is enabled, the microphone impedance is set to 2.1kΩ and the frequency response curve is given a subtle mid-high boost – all in the analogue domain. We’ve been building mastering-quality digital audio converters for decades, and the converters you’ll encounter in the Red 4Pre are the best we’ve ever made, employing a 'parallel path summing' configuration to lower the noise floor. We’ve selected high-performance, precision conversion chips and maximized sound quality through premium component selection, advanced design and optimized board layout. Red 4Pre's converter design strikes a precise balance between multiple factors – including dynamic range, distortion, noise floor and conversion latency – for the optimal overall sound. With 24-bit/192kHz sampling capability and 118dB(A-D)/121dB (D-A) dynamic range, it is ideal for high-resolution audio. The Red 4Pre delivers ≤0.0009% THD+Noise and a frequency response flat from 20Hz to 35kHz ±0.25 dB or better - and when we quote a specification, you can rest assured it’s what the Red 4Pre will actually give you on a real session, not a purely theoretical figure pulled from the converter chip’s data sheet. Low latency is a specific Focusrite design goal. Red 4Pre's latency is so low that you can track with your preferred plug-ins and record virtual instruments in real time. This low latency environment simplifies your workflow, allowing you to run a single mix on your DAW for both overdubbing and mixing, with your plug-ins in place, all the time. Connect up to 64 additional channels to the Red 4Pre via Ethernet-based Dante networking - a simple, single connection carrying both audio and built-in clocking. Whether the Red 4Pre is connected to the computer via Thunderbolt, DigiLink or Dante, simply connect units such as two RedNet A16R (32 channels of analogue I/O), four RedNet MP8R (32 channels of RedNet mic pre), or other Dante-enabled products via Ethernet as desired. Place mic preamps where the music is, and outputs where the sound needs to go – wherever there's an Ethernet connection. Unlike daisy-chaining via Thunderbolt, Dante lets you run additional channels over a greater distance, with low latency and lower cost, without wasting money on technology or connectivity that will not be used. And it will only get easier: look out for future enhancements offering complete plug and play Ethernet expansion functionality. Red 4Pre includes the new Focusrite Control software, providing a straightforward and intuitive way to set up mixes and monitoring, as well as controlling the mic pres – recalling settings, assigning stereo pairs, adjusting gain and enabling features such as high-pass filtering and phantom power. In addition, Red 4Pre is packaged with Softube's Time and Tone Bundle – a unique plug-in pack including four of Softube’s professional quality plug-ins: Drawmer S73 Intelligent Master Processor, TSAR-1R Reverb, Tube Delay and Saturation Knob. Also in the box is the Focusrite Red Plug-in Suite, which accurately models Focusrite’s classic Red range 2 and 3 equalizer and compressor hardware. The Addictive Keys virtual instrument from XLN Audio is now included for free with all Focusrite audio interfaces, and is available for existing customers as well as new customers. One full license per account enables you to choose one world-class Addictive Keys instrument, such as Modern Upright, Studio Grand, Electric Grand or Mark One. NOTE: Due to the inconsistent performance of Thunderbolt chipsets on Windows computers, Focusrite has not released a driver for Red 4Pre, Red 8Pre or Red 16Line to enable performance with Windows. Focusrite prides themselves on the quality and performance of their products. In the case of Thunderbolt drivers for Windows, they cannot guarantee a high level of performance with Windows.